Support Center / General Information / How to log in to ProtonVPN? How to log in to ProtonVPN? This article explains the difference between Proton credentials and OpenVPN credentials, what they are used for and where you can find them. There are two sets of credentials for ProtonVPN, which adds privacy and security for our users. Note: For existing ProtonMail customers, your Proton credential is your regular ProtonMail username and password. The OpenVPN credentials: These are automatically generated, but you can change them manually. They are used together with third-party VPN clients, such as Tunnelblick on MacOS or the OpenVPN package on GNU/Linux. For detailed guides on how to connect to ProtonVPN, check out our step-by-step installation guides for Mac and Linux. If you have trouble logging in with third-party OpenVPN applications, click here to solve the problem. Optional:Set your OpenVPN login to something memorable. Note: We strongly recommend to use a non-descriptive name which is not related in any way to your ProtonMail login! Set your OpenVPN password by clicking ‘Set OpenVPN Password’ and following the prompts. Note: We strongly recommend to use a long, unique password! Never repeat passwords! Log into the web-based dashboard at mail.protonmail.com using your ProtonMail account. Go to Settings and click the VPN on the left. Optional: Set your OpenVPN login to something memorable. please tell me if the protonVPN platform is GDPR compliant? If so, can you send me a DPIA? I need for my clients, I can advertise. Does ProtonVPN work for Chrome OS? I own a Chromebook and Chromebox for work, but attempts to bolster my privacy with services such as ProtonVPN or even the LastPass Secure Note feature don’t work with Chrome OS. Sigh. Hello. We do not currently officially work with ChromeOS and there is no time span on when we will since its a bit complicated. I can’t connecting to server & when you gonna make an app for the iPhone? Our iOS application is planned to be released late Q3, or Q4 this year. Hi, I just logged in to ProtonVPN but i’m confused with what i need to do next? How do i know if it is working? Hello. Simply click the quick connect button, get the message that you are connected and your are good to go. Whenever you dont want to use VPN, just disconnect it by clicking the disconnect button in the application. Help, Open VPN just updated it’s app and no longer works. Hello Will, no certificate is needed, make sure your username and password is entered before connecting since new updates has caused its deletion. Hi Team, Can you advise when the ProtonVPN will be available for iOS devices. Im currently using the OpenVPN which is not ideal and would like to switch the the Proton version as soon as possible. Hello Neil, iOS application is really close to be released in to closed beta, so we expect it to be in the apple app store by the end of Q3. Hello Ahmed. Sorry, enough for what, security? Changing password after the payment is done has no effect security wise. I have just changed my Protonmail password, and now I am not able to login to the VPN. Does the VPN password change when the email password changes? I ask because I am using the correct credentials of my Protonmail username, and the associated password. I am using a Chrome browser. Hey, Protonmail and ProtonVPN credentials are the same for the website or application logins. Hi, I find it should be more convenient using my VPN connection just loging in, without the need to install programs on my computer. Is it technically possible? Thanks. Hello. Technically its impossible since the VPN tunnel has to go trough a virtual adapter , otherwise its just a proxy which does not provide that level of security. Hello, how can we solve the problem that we cannot connect to the server from China? It can be used normally before, but it cannot be connected these days. No connection to any of your Servers now …. after it has worked for almost 2 years from China. Hello. Please test out our newly released servers in Poland and Czechia as they could still be not blocked. How can i use VPN on Xiaomi r3 router? Hi! Trying to configure OpenVPN on an iPhone. All steps worked except I cannot get my username or password to stay in their respective boxes, even when enabling the Save button. Any workaround? The instructions seem to be clear, but the web page does *not* behave as it should. It keeps telling me my login credentials are incorrect, when in fact I’m copying them from the page. Plus, within OpenVPN, it keeps resetting my user ID or password, depending on whether I’m trying to update the OTHER value. Very frustrating and useless. Hi, could you shed some light on connecting to VPN servers in “5 eyes” or “14 eyes” countries? How is one’s privacy/security effected exactly when connecting to a server located in these countries? Hello. All servers are configured the same way regardless of the country and it is done by working with trusted data centers in order to ensure that no data is being logged on them. However, if you are concerned about privacy laws in certain countries, the best solution is to use our Secure Core servers which we physically own. I recently started using proton VPN. It is great. As long as 5 devices can use my account VPN, I decided to install the Proton VPN on my father’s Cellphone, but vpn password is the same of that with my Email. The problem is that I do not know how to make the pass in my vpn different from that of my Email. I was wondering if can get help. In addition, I was also wondering if even I can give my father another usename. Hello Hadi, we are sorry to say but the accounts are tied together, so you cannot split the password/username in to two when its for one single account. Also, if your dad uses android, download open vpn for android client and set up the open vpn files in that and use the open vpn credentials which are separate from your mail login. Hi – Congrats on a fantastic and intuitive, simplified service that did not exist back in 2003 when I first started raising a red flag about Google’s invasiveness, both as a search engine and a newly-born email service, as well as questioning Facebook and its privacy aspects. Can I humbly suggest that you take the post from the following person (below) and turn it into an FAQ about how ProtonVPN works. I was looking everywhere for just this basic understanding about whether my connection current browser are automatically protected, or if there is a *special window* to begin accessing the VPN. Thanks for an awesome service! Love, love, love this stuff! Slight snag: I’ve got an ‘authentification fail on my iOS device. I followed your steps above, but cannot get in. Where might I have gone wrong? It all works fine on my laptop, so I know my VPN credentials are changed: what might I have missed? Thank you! I subscribed to 1 year plan which includes 5 devices. Shall I use the same vpn login for all devices or I may create new for every device? Hello Mark, you have to use the same credentials, for all deviecs, that you use for protonvpn.com and you dont need to create new accounts. So correct me if i am wrong, it is my understanding that once signed in additional log in is not required for secure access? If browser is closed , or computer shut down , connection needs to be manually reestablished? Also does browser selection change anything. Which browser is recommended? You’ve done a smashing job with all of this. Thank you..
Where do I find my authentication information password for connections using Mac OS beta app? Hello Thomas, MacOS beta application credentials are the ones that you use for ProtonVPN. 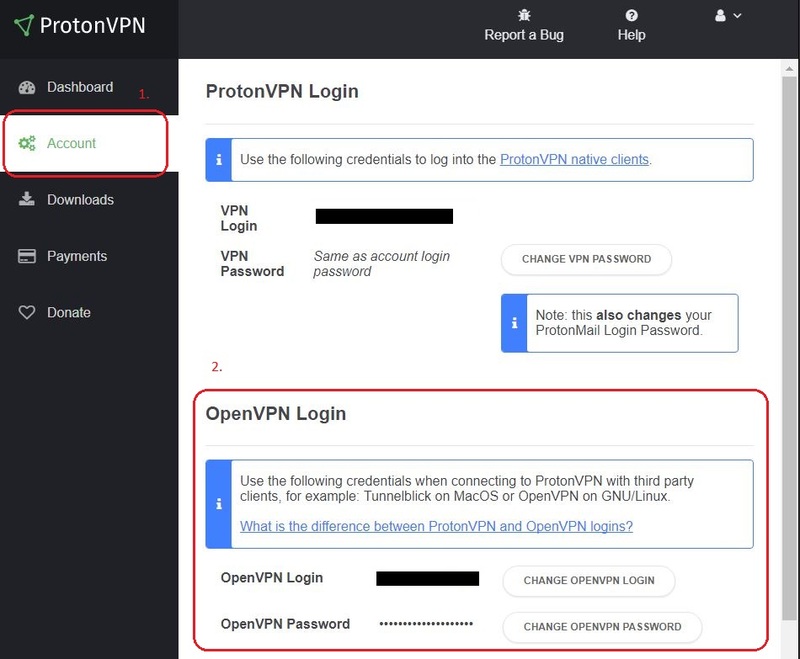 There are two types, Openvpn credentials and Protonvpn credentials, so Protonvpn (the ones you use to sign in to our website) are the ones that you need to use. Hello! So if I understand correctly, there is still no ProtonVPN for iOS (Apple iPhone)? Thanks! Yes, you are correct, we are focusing on developing this application now but sadly we cannot tell you any ETA for that. How do I share my proton VPN plus to family I don’t want to give them my full credentials. How do I invite members I have up to 5 shareable? We are sorry to say but currently there is no way to share the connections without sharing the account itself with your family members. Also, as a security company we do not advise account sharing for various security reasons. Thank you for the reply and answering my question. I’m very satisfied with the service and you’ve gained yourself a long term customer. We are happy to hear that you are satisfied with our services, this is what we strive for and always will! It would be great if we could also have the openvpn password available on the protonmail settings page. It would avoid the hassle from having to login into the openvpn site separately. Is there any security concern as to why it is not available there already? Thank you for pointing that out, we seem to have missed that as it was our foult on not making it the same on both pages. The issue is registered and changes should take place this week. mais ensuite , comme utiliser tunelblick il demande des fichiers ? Proton ? Please log in to http://www.protonvpn.com and click on macOS beta section. If you have a paid VPN account , you can download macOS beta application for better user experience. I ve already looked on your support hints. Could you please contact our support and inform about the situation? To be short, there is no real big difference in these protocols. The security level stays the same, what can change or fluctuate is speed and stability. UDP is know to deliver better speeds while TCP is know to provide more stable connection with slightly higher ping. Hi, the Mac Version of ProtonVPN should use Tunnelblick as a connecting client, but recently it always shut down and, cannot change the OpenVPN account info at ProtonVPN’s dashboard page. When will you publish a MacOS version app on MacStore? It should be much better. Our current macOS beta app is released for all of our paid users. You can check it out on your protonvpn dashboard – macOS beta tab and download it. I have downloaded and installed the Proton Email and Proton VPN (free one). Once I log in to the VPN and connect, do I have to restart my Google Chrome Browser or use a specific (Proton) friendly browser? Hey Stang, once you connect to a VPN server, you don’t have to do anything else. You can simply continue using the internet as usual, no restarts are needed. Thanks for the fast help and great service! When i try to connect with the VPN app and choose a server only the cancel button works, the ok button will not register my clicks no matter what. Why is this? Hey Adam, most likely you either have another VPN profile with Always-On VPN feature turned on (you can check it in your phone VPN settings) or you are using an app which is drawing over our app. screen. In this case the user is not permitted to grant any permissions, since the window describing the risks may have been altered by the application drawing over it. Note, that if an application has the permission to draw over other apps, it is only relevant for permission granting if it is active. How to I know where to find my openvpn credentials, i dont understand. 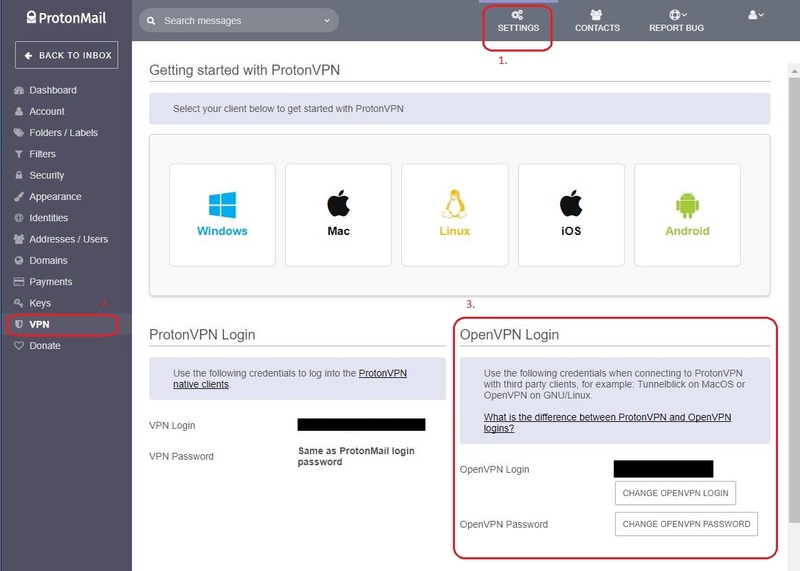 You can find your OpenVPN credentials if you log-in to protonvpn.com, and navigate to the Account category. You’ll need to use those credentials for the OpenVPN platform. The instructions for linux are good but it only works on the command line. After setting the password in network manager and hitting ‘save’ nothing happens. ‘use vpn’ ticked in ethernet connection. Clicking back into edit the vpn, the password field is now blank. Changing any option on the right including ‘ask for password’ does nothing and produces no errors. Using sudo to open network manager has same result. Is the save button enabled when pressing? Some distributions have problems reading the OpenPVN config files and prohibit saving because of it. We do recommend the CLI version at the time due to potential DNS leaks in previous network manager versions. How convert “OVPN file” to a “ONC file” for Chromebooks??? I’ve tried running Android version of ProtonVPN on my Chromebook and it crashes instantly. Too bad, other VPN apps work just fine. Hello Robert. We are sorry to say but our application was not designed for chromebook devices , thus we do not guarantee its functionality. We will do our best to proceed with the development and support as many devices as possible. Support from me regarding Chromebook! Would be fantastic. Do your servers use `auth-user-pass-verify` option? I am trying to authenticate with `auth-user-pass` option and it doesn’t work for me. Not sure if this is fault of your servers or Debian openvpn client. 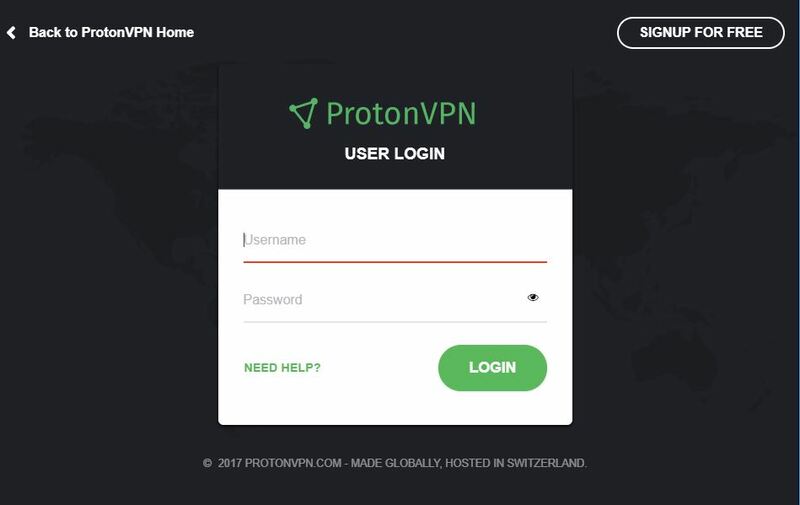 Hello, I am clearly aware there is one login for the ProtonVPN account that is the same as my login for Proton Mail and a second login when trying to connect to the VPN. It was working fine in the beginning for several weeks but recently it would not connect and would say that user and password were not accepted by the remote server. I double checked everything and it still wouldn’t go through. So I went into the Proton VPN account settings and changed the password. Even after doing this and inputing the updated password I would get the same error message. Help please! I notice that my apparent public IP address is the same every day when using your VPN. With other VPN services, they change the IP address each time you log in (even if it is logging in to the same distant country). If I have the same apparent IP address with protonmail vpn every day, can’t someone see the patterns in my internet use or otherwise track my usage, etc.? If so, do you recommend that I manually change which of the countries I sign in to every day? Or, is having the same apparent IP address not a problem security wise? Hi, you can chose your IP address by chosing a specific VPN server (each of our VPN servers has a specific address). Even if you use the same IP address every day, third parties will not know it is you because 1/ they do not receive information who requested the content, all they see is the IP of the VPN server, and 2/ this IP would be shared with all users who are connected to that server. Example: 100 users are connected to server CH#1 and surf on the intternet, third parties will not know which of the 100 users requested which website. What the mean 27%, 3%,10% or 26% in a country? Can I connect to the van service directly using my router or my firewall? I would prefer to secure my home connection by using my own equipment, is this possible? Another vote for Chrome OS Support. doesn’t work on iPhone. I followed the instructions to the letter, installed OpenVPN, installed the scripts that should have worked. I set up user and pass as instructed and time after time “authentication failed.” I have noticed a red seal below the external certificate profile that reads “none selected and will not let me do anything when I try. blocks ports for free Internet offered by these vpn services, always the service is available just for sometimes before later got blocked..
Hi, I have no VPN Password for Tunnel, only a button to change it, but I have no old password then to type in. Everything else is working. Cannot get this damn thing to work on my Mac. Config files are in Tunnelblick. OpenVPN login credentials good. OpenVPN password fail. Now I’m trying to change OpenVPN password in Protonmail VPN settings but can’t. Saying current password is wrong. There’s no way for me to reset password. What is the difference between the native client and OVPN? Setting VPN on my android device and using the documentation here but I am not sure where I find my current OpenVpn password under settings. There is a set/open password option but that seems to assume I am trying to change my password and prompts for my current password when trying to set a new password. yes, there is no way to reveal your current openvpn password. you can simply set a new one without knowing the old. Can you share a bit more how security of mail accounts is maintained when mail account credentials (at least for Visionary accounts) can also be used to log into ProtonVPN? Wouldn’t it be safer to separate the two, so that any compromised security wrt ProtonVPN doesn’t also mean a compromise for one’s ProtonMail account? Additionally, there is always the possibility of creating a separate standalone VPN account not linked to your Mail account. you totally copied an admin link, we cannot use. Do i need to pay for this vpn or its free to use. Can I use the VPN from from my iPhone? Can protonVPN be setup at the router level? I’ve installed and logged in, but how do I use it? I use the internet via google chrome. Is it automatically securing my use of Chrome? I’ve just signed up ProtonMail for free but I cannot find any ProtonVPN Login credentials in my account because it says: “ProtonVPN beta is currently available for Visionary users.” Why that?! Hi Gianni, currently we’re running a closed technical beta for our Lifetime, Visionary, and Plus users. We’re moving closer to a public release at which point it will be available to everyone. If you really want to beta test, consider a Plus subscription. Stay tuned. To confirm, is ProtonVPN available to Plus subscribers, or only Visionary? Hi Matthew, ProtonVPN is available to Plus users during the beta. Try a hard refresh of your ProtonMail page to clear that message. [ctrl]+[f5] on Win & Linux, [cmd] + [shift] + [R] on Mac. I successfully manged to get ProtonVPN running on Linux (Fedora) and Android. I imported the ca.crt file via chrome://settings/certificates to the “Authorities” foldler and set the trust switches. Then I added a VPN entered the IP address 185.159.158.51 in the Server Hostname field, entered the ProtonVPN username & password but it does not connect. I also tried putting the hostname in with the port 185.159.158.51:1194 but this doesn’t work either. Is there any way I can get this working with chromebooks? I just wanted to second the idea of Chromebooks! I’m planning to get one as my main PC and support for it would be great! Support for ProtonVPN on Chromebooks is critical for me also. I hope the task of setting up the capability and publishing a “how to” guide is given priority. I’d like to third this request! I would like to ‘third’ the idea for extending your reach to chromebooks. Linux and Android work really well. Chrome os support is vital please ensure its possible. Yes please! My pixelbook needs a real VPN. Hello! We are still working on this project, but for now our main priority is iOS application. Hello Christian! Just trying to setup PrptpnV6eoth OpenVPN, on my Android. I am getting promoted for a Certificate. Did this happen to you? How did you resolve it? +1 for protonmail vpn on chromebook. As a digital security consultant i recommend chromebooks as a possible solution to solve certain challenges my clients may have. whether a vpn providers works on my chromebook is a criteria i use for recommending them.